Rajiv Gandhi International Cricket Stadium (Uppal Stadium) is the only international cricket stadium in Hyderabad. The stadium is located in Greater Hyderabad, Telangana. Rajiv Gandhi cricket stadium has a seating capacity of 33,000 which is a big number and the stadium is also spread over a large area of 16 acres. It is the home ground of the Hyderabad cricket team and the Hyderabad Sunrisers (IPL Team). The stadium is owned by the Hyderabad Cricket Association. North end and Pavillion end are the names of the ends of this stadium. This stadium hosts One day international (ODI) matches, test matches, IPL matches and first-class matches. This is one of the best stadium in the country and it has always been a delight for the cricket fans to watch matches here. IPL Tickets in Hyderabad 2019 are out through eventsnow website. 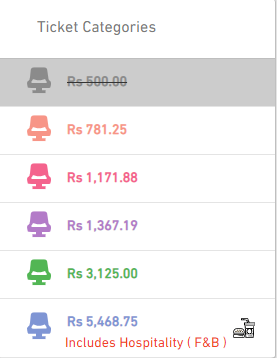 IPL ticket prices for Hyderabad stadium already shared. As per the expectations, ticket price might start from 500 Rs and they completely depend on the match type and opponent team. GST addition also affects SRH ticket rates. Ticket rates start from 500. The Hyderabad stadium IPL ticket booking has become quite simple, it could be done online. You can book SRH IPL tickets Hyderabad by visiting the eventsnow.com website or mobile app. Once tickets are booked, the entry pass for entering the stadium is needed to be collected from the Box Office. The box office is located near the stadium, just outside the stadium. The card which is used for online payment along with the photocopy of online tickets should be taken while collecting the entry pass from the box office. Here are few steps for booking IPL tickets online at any time of day. The tickets are available on eventsnow. Login to ticketing website and look for Uppal stadium tickets booking online. After making the payment, you can collect the tickets from the box office. The box office address details will be given on the checkout page. Also know about Feroz shah Kotla Stadium and Mohali Stadium. While leaving for the Rajiv Gandhi international stadium, you should keep a note of a few of the things if you want to have a better experience. After collecting the entry pass from the stadium, you can check the gate number printed on it. You have to take that gate to enter the stadium and reach to your respective stand. The stadium security allows only a small number of things inside the stadium. So avoiding carrying unnecessary items is highly recommended. Try to avoid taking anything else than a wallet and mobile. The list of restricted items is rather long, which goes as: Data cables, chargers, earphones, coins, metal objects, water bottles, plastic carry bags, binoculars, cameras, eatables or drinkable. However, some of the baby items are allowed such as baby diapers and baby food, etc. The security guards if detain any item, then chances of getting it back at the end of the match is rare. So it is better to avoid any such case. The entry gates of the Rajiv Gandhi stadium generally open 3 hours before the start of the match. So you can reach there early to avoid last moment rush and traffic. Rajiv Gandhi international cricket stadium official website is www.hycricket.org. The stadium is in good condition and it has all the basic facilities. The cafeteria present is also big and you will find descent food there. There are enough number of washrooms available. The stadium has various premium facilities which include commentators room. There are exclusive room for umpires and corporate boxes are also available in the stadium. The practice area is big enough and it has reception lounge. Its state-of-the-art dressing rooms for teams is something to boast about. I am sharing the seating layout and map of the Uppal stadium. 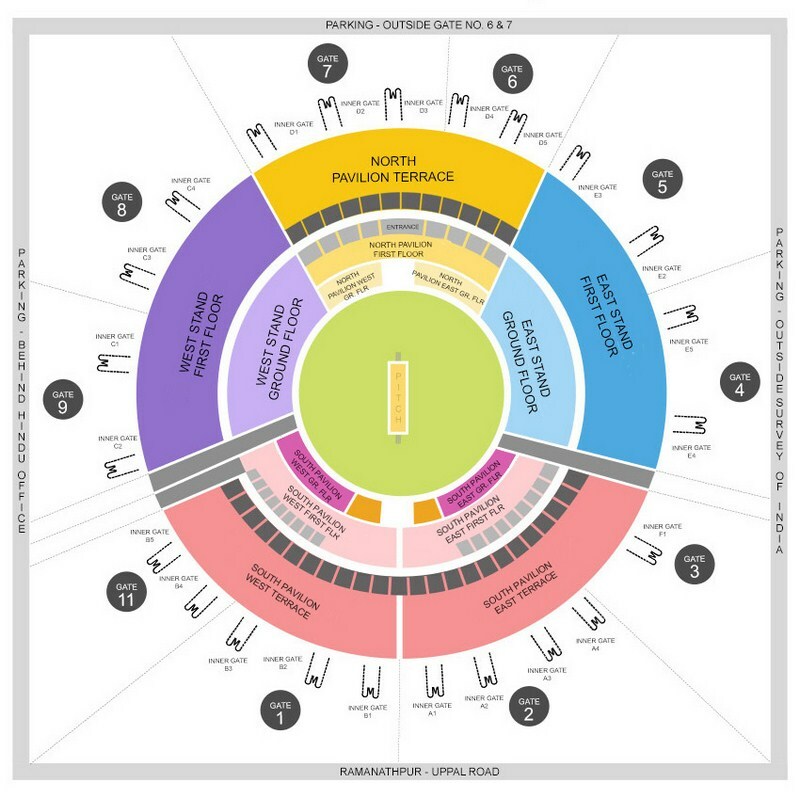 Seating map will help you to book cricket match tickets easily. It is also helpful in finding the seats in the stadium. All the gates, cricket stands, pavilions, parking slots, etc. also depicted on the map along with seating arrangement. Below is the schedule of IPL 2019. The full schedule of IPL matches in Hyderabad Uppal stadium is announced. IPL Final 2018 has been played at Rajiv Gandhi Intl. Cricket Stadium, Hyderabad. The Rajeev Gandhi stadium has already hosted a number of matches successfully. This stadium has given some of the unforgettable moments to cricket fans. The aura which is created when some of the crucial matches are played in this cricket stadium is just extraordinary. There is always a rush at the end and the beginning of the match near the stadium, so it is advised to use public transport for reaching the stadium. It would save your effort and time on parking and driving. The food which is served here is also good. The view of the stadium from the stands is also lovely.